Hi Sylvie, such a cutie, love your card, I will forgive you for posting a Christmas card but don't let it happen again, shakes finger rapidly, ROFL. A fabulous christmas card Sylvie...love the snowman. Enjoy Ally Pally. 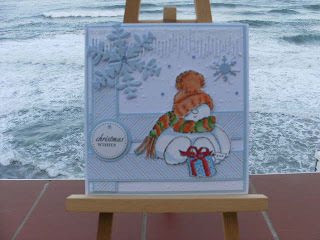 Crazy to have your fab snowman there against that gorgeous blue, lacy sea! Good for you thinking of Christmas already! Love your gorgeous snowman card Sylvie. What a long way to come for a craft show, hope you haven't brought too many clothes, you may have to leave them behind with all the crafty stuff you will buying. I will be going but not till Sunday. Such a fun card. I can feel the icy chill from that snowflake and snowman. A really fun festive card,lovely work! Such a cute card Sylvie. I really have to get that wee character - he's fab. Enjoy your Ally Pally experience! My sweet friend thank you so much for asking about me, I am fine considering, still think I am in denial about it though. Wishing you the most fabby time in London wish I could come and meet up with you, have fun and don't spend too little, that would be rude LOL. Lucky you going to the Ally Pally, love your card for the xmas club gorgeous image and papers. Great card Sylvie. Love Snowy he is so cute. Like the way you changed the sketch too. Sorry I only saw you very briefly yesterday but hope you had a great time. I was very impressed with Ally Pally and will definitely go again.